Project obstacles and solutions: The Bridgewater is a high-end residential development in Westfield, Indiana. BAM Outdoor are landscape designers. They were contracted to excavate and build two ponds. 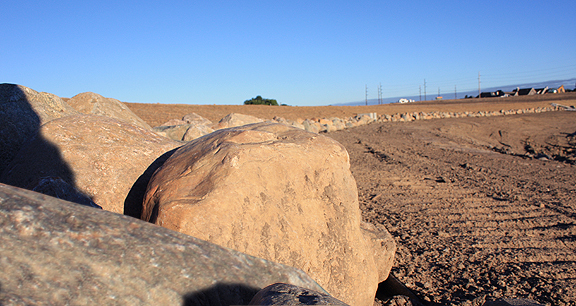 They contacted IMI Aggregates to provide nearly 700 tons of boulders to encircle the ponds. The boulders were selected from the IMI Pendleton gravel, sand and stone quarry for their aesthetic qualities and to provide an erosion barrier around the perimeter of the two ponds. Timing is key in any construction project. Excavating a 25 acre pond that is central to a new neighborhood led most of the other early infrastructure improvements on the property. As is many times the case, there were delays in the early work that were crucial to getting the rest of the job completed on time. To meet construction schedule demands, 400 tons of boulders would have to be loaded and delivered in one day on short notice. The Pendleton quarry was over 20 miles from the construction site. There were restrictions on the route taken by the trucks. Drivers were limited to 20 tons per load. When the call came, IMI was able to make the delivery and keep the project on schedule, making 20 trips in one day. For more information on IMI Aggregates, click here.